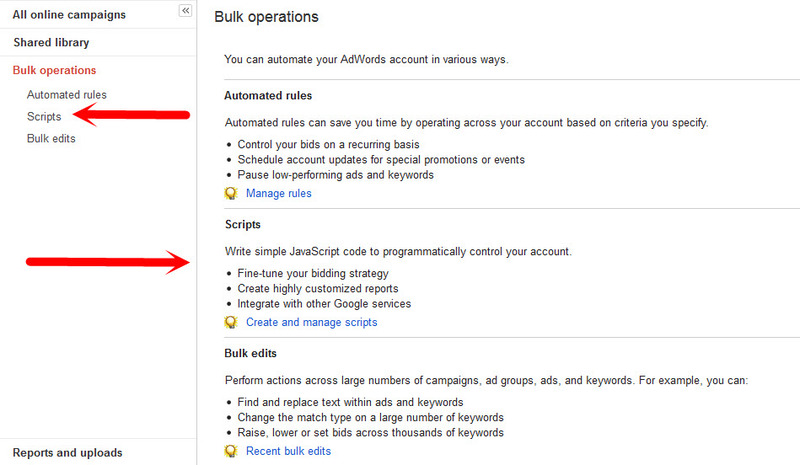 If you aren’t already using scripts on your AdWords account, you probably should be. Not only could they save you a wedge of time, increase accuracy and provide an easy way to create reports, they can be tailored to report on almost any aspect of your AdWords account. To help you get started with them we’ve compiled four helpful scripts. AdWords scripts can be as simple or as complex as your coding skills allow. Mine are far from top notch, so I rely mostly on those already written by some of the people in our community who have the knowhow and are generous enough to share them with the rest of us. They can execute almost any task from texting or calling through your requests, to providing a daily summary report. Scripts can give you a report of your quality scores, multiply bids according to the weather, and everything in between! This is handy for smaller accounts, but can be a life saver for managing large accounts. Where Do They Live in AdWords? Where Can I Find AdWords Scripts I Can Use? The King of AdWords Scripts is almost undoubtedly Russell Savage who has set up a most awesome website offering the rest of us access to a plethora of scripts to create all kinds of magic within your AdWords account. Google also offer a number of scripts and templates which we will touch on in the next section. If you have an ad pointing to a broken link it won’t show as you’re probably well aware. Usually you will be notified by Google when this happens, but what if the registered email address belongs to someone else, say a client or an ex-employee ? This is where the 404 script is invaluable. In the link below below you will find an example you can copy and paste straight into your AdWords account, making sure to change the ‘example’ email address to your own. It will track 404 and 500 codes on the schedule you have created, and will email you as soon as it finds an issue, simples! This script will create an overview report of your account and send it to your email box at a frequency set by you. You could also arrange for it to be sent to others, or if you are able to format it professionally, send it straight to clients. This remarkably useful bit of script disables ads and keywords for items that are out of stock – how useful is that to the site owner AND the user?! Not only will this save you money on advertising stock you don’t have, but it will assist with CRO by only advertising offers you are able to fulfil, not disappointing the customer, and ultimately building trust and reputation. Dynamic text ads can really draw viewers in, offering an even more highly targeted ad with up to date information. One way in which this can be utilised is the Sale Countdown script. The script essentially runs a countdown of days and hours to a target date set by you, and updates all ads in the ad group accordingly. This script can also be run across multiple ad groups. You can find the full library of Russell’s scripts at his website, but DON’T FORGET to change the email address and always carry out a test run before implementation. If you’ve found any other great scripts then please leave them in the comments below. Thanks Scott, I’m glad you found it useful! I think for many scripts are one of those things that go on the list of ‘must find out more’ and then get forgotten about! Thanks for the great writeup Laura! Feel free to reach out to me any time if you have an idea for a new AdWords script, or how to improve an existing one. Thanks for the great content to write about – you have made my life WAY easier and that of many others I’m sure! Laura, this was greatly helpful. I had known about Adwords Scripts (or, let’s just say, I noticed the scripts link on the page and always wondered! ), but never had any idea how to use them or go about it. Thanks for the tips!